The clever designers at Wow! 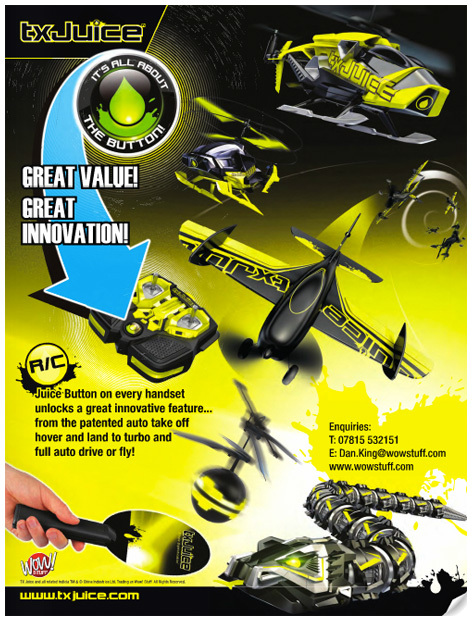 Stuff hit the bullseye again with their incredible TX Juice range of radio controlled toys. With a spectacular design and stunning black graphics on yellow bodywork, the a.i.Copter incorporates an innovative automatic take-off and landing system that virtually eliminates the possibility of crashing. The patented ‘Juice’ button on the helicopter’s hand controller activates the ‘auto-take-off’ procedure which prevents a sudden lurch towards the ceiling with potential catastrophic results! Made of lightweight materials to aid long battery life, a.i.Copter is just one of a range of innovative TX Juice RC models. Please tell us what you think of TX Juice a.i.Copter by WOW! Stuff.